1). When are you on the clock and when are you off? 2). Would you give your friend a $500, $1000 or $5000 gift? Typically the value of our services, whether you are a planner, invitation designer or photographer, goes into 3, 4 or 5 digits. I don’t know about you, but I’m not typically giving people several thousand for a wedding present. 3). You want to STAY friends, right? It’s hard enough working for friends or family, but throw in the emotions of wedding and it could get even stickier. If they are less than satisfied (for any reason, beyond your control or not), is it worth risking your relationship with them? Everyone thinks it could never happen to them, but it can – and it does. 4). Are you prepared to shell out for a backup plan? Of course there are exceptions to every rule – one of my most favorite weddings was photographing our friends in a beautiful resort in Puerto Rico, and I thank my lucky stars it worked out. 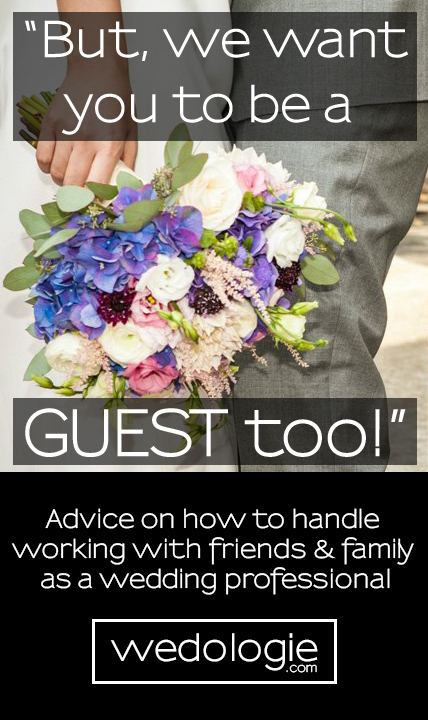 It was small, intimate and I knew (or got to know) every single guest, so I was able to balance the line between hired/guest, but that was a very usual circumstance. If your friends or family insist on hiring you – treat them as you would any other client – provide them with a contract and make sure they have very clear expectations of what you will and won’t do. If you provide a discount or “extras” make sure this is outlined in the contract as well. Make it very clear that if they hire you, you are in business because you have bills to pay, so you should be treated no different than any other wedding professionals they contract. My opinion? When you get the opportunity to be a guest, take it. Enjoy the wedding, a rare day off, and let the hired professionals do their jobs (and yes, you may silently judge them, knowing you could do it better – just stuff your face, drink & dance until it doesn’t bother you anymore).